Bhubaneswar, September 11, 2018: District Mineral Foundations (DMF) in Odisha fall short of benefitting the mining-affected people due to some crucial institutional and administrative gaps, points out the only independent assessment of DMF and PMKKKY scheme done by Centre for Science and Environment (CSE), a New Delhi-based non-profit policy think tank and public interest research institution. People First: District Mineral Foundation (DMF) Status Report, 2018 – as the CSE report is called -- is an in-depth assessment of DMFs across the country as the scheme enters its fourth year. The report covers 12 states in India, and closely studies the DMF administration and investments in 13 districts in the top five states, including Odisha. The report and its findings, specifically with respect to Odisha, were discussed today in a public meeting in Bhubaneswar. The meeting was attended by officials of the Odisha Planning and Convergence Department, civil society organizations and media representatives. Earlier, on July 31, the report had been released nationally in New Delhi, in the presence of representatives from the state and Central governments, district administrations from mining-affected districts, NGOs and media. “DMF is a defining opportunity to overturn the decades of injustice meted out to the millions of people living in deep poverty and deprivation in India’s mining districts. The law as framed is also a crucial opportunity to ensure people centric governance and decision-making. But this can only happen if DMF isdeveloped and implemented in the letter and spirit of the Mines and Minerals (Development and Regulation), Amendment Act, 2015 and State Rules developed under it. Our assessment shows that so far Odisha has failed to implement DMF in the right spirit,” said Chandra Bhushan, deputy director general, CSE. R Balakrishnan, Secretary of the Odisha Planning and Convergence Department, under which DMF is placed in the state, shared the state government’s position. “Odisha is focusing on convergence for DMF implementation because it brings in various departments that are looking into various issues that DMF is looking into,” he said. He said that there is a DMF nodal person in each line department of the state who is looking into DMF proposals coming from various districts to review the feasibilityof the projects. The review report is then sent back to districts where the DMF body finally approves the project. Balakrishnan also highlighted certain issues that need to be relooked at to improve DMF implementation – these include selection of the affected areas, DMF office and administration, how to effectively engage PRI members etc. DMFs have been instituted to be established as a non-profit Trust in every mining district of the country under the Mines and Minerals (Development and Regulation), Amendment Act, 2015. They have a precise and legally defined ‘objective’ to ‘work for the interest and benefit of persons and areas affected by mining-related operations’. The law also require DMFs to be guided by the provisions of the Constitution of India as it relates to Fifth and Sixth Schedule Areas, the Panchayats (Extension to Scheduled Areas) Act (PESA), 1996, and the Forest Rights Act (2006), all of which guards the right of people and makes them part of resource governance. No DMF Trust in any district of Odisha has identified its beneficiaries – the mining-affected people. This is a fundamental obligation of DMF Trusts, as the law clearly defines the mining-affected people who must be identified and benefit through DMF, highlights the CSE report. These not only involve people who are living in mining-affected areas, but also those who have been displaced and resettled, lost their livelihoods including forest-based livelihoods, and those who had user and traditional rights over the land. “By not identifying the beneficiaries, DMFs thus have left out some of the worst-affected people from the benefits of DMF,” saidBhushan. Besides, leaving out beneficiaries, DMFs have not fulfilled their other obligation of engaging Gram Sabhas in DMF decision-making. Sidelining Gram Sabhas goes against the mandates of the MMDR Amendment Act as well as the State Rules and the Pradhan MantriKhanijKhestraKalyanYojana(PMKKKY) guidelines, all of which emphasize on Gram Sabha engagement, particularly in Scheduled Areas for deciding on DMF works, monitoring and identifying beneficiaries. “There is little information available showing that Gram Sabha consultation has happened for identification and approval of works to be done through DMF funds or for identifying beneficiaries,” says Srestha Banerjee, programmemanager of environmental governance unit, CSE. “In a few cases where approvals have been taken from Gram Sabhas, it has been a formality, where the village heads are informed of the project and told to sign the papers,” she added.The whole of Sundargarh and parts of Keonjhar district are classified as Schedule V areas. There is no scope for representation of mining-affected communities in the DMF bodies (the Governing Council and the Managing Committee)in Odisha. The DMF body is dominated by district officials and political representatives from mining areas. The only “people’s representation” comes from the few elected members of Panchayati Raj Institutions (PRI). 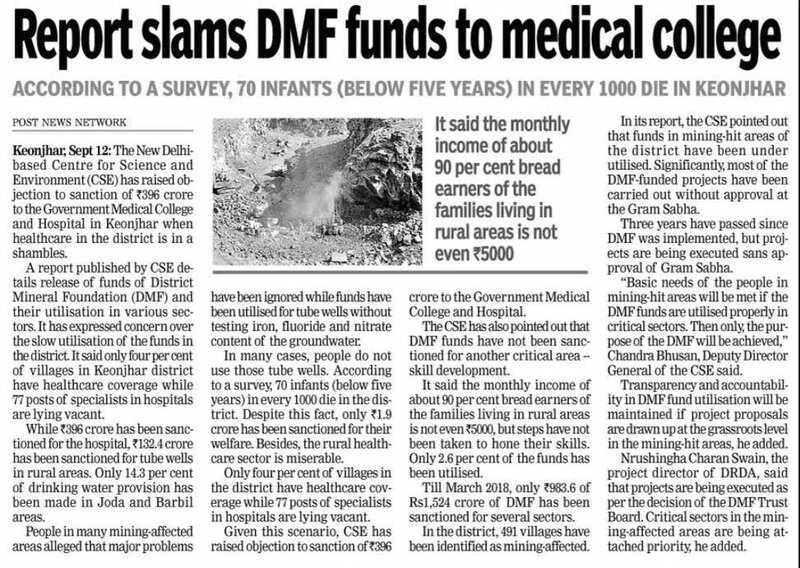 “Sidelining of Gram Sabhasand lack of representation of mining-affected people in the DMF bodies not only goes against the people-centric idea of DMFs, it has also affected decisions on proper fund use for issues that are of urgency for the mining-affected people,” said Bhushan. The findings of the CSE report on DMF investments clearly brings this out, he added. With more than Rs 5,000 crore in DMF Trusts, there is a huge scope for the mining districts of Odisha to address some of the pressing issues of the mining-affected communities. However, this can only happen if DMFs develop investment plans through proper need-based assessment – says the CSE report. However, no district has developed a comprehensive DMF plan to ensure need-based investments in mining-affected areas. The work sanctions so far are ad-hoc. Of the Rs 2,589 crore sanctioned so far for projects under DMF, over 33 per cent is for building roads and bridges. In fact, investments in such infrastructure have been alarmingly high in some areas, such as in Sundargarh district. For instance, in Koida, Sundargarh’s worst mining-affected block, a whopping 80 per cent of the DMF investments is for big infrastructure. Balakrishnan said that “while some infrastructure development is important, structures must be converted into service delivery infrastructure”. Investments in other sectors like healthcare and education are also construction driven, ignoring the need for human resourcesto service the infrastructure or to improve access to these facilities. For example,in Keonjhar,almost the entire health sanction of about Rs 396 crore is for construction of one medical college in the town.“This is despite the fact that only about 4 per cent of the villages in the district have access to a primary health centre within a five-kilometer radius, and many of them do not have the required health staff,” says Srestha. Recently, the district has advertised to hire doctors in some places. Investments in many cases are also urban-centric, having to do nothing with mining-affected areas or people. For instance, in Sundargarh district, Rs 113crore has been given for piped drinking water supply in three municipalities, which are not even “directly-affected” by mining. 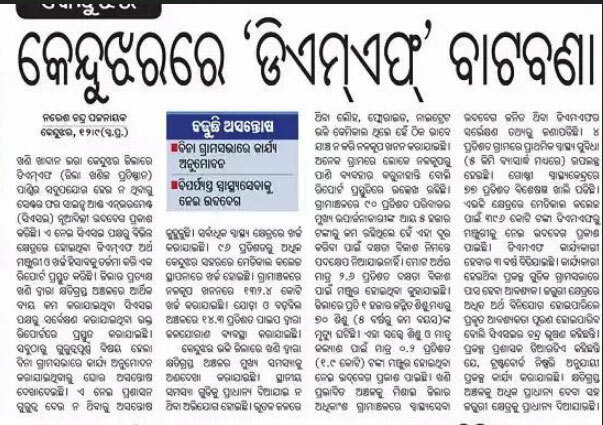 In contrast, the district’s worst affected Koida block – which suffers from severe water pollution -- has got only Rs 7.5 crore.Similarly, in Jharsuguda, more than Rs 13 crore from DMF funds has been sanctioned for providing power supply to the local airport. 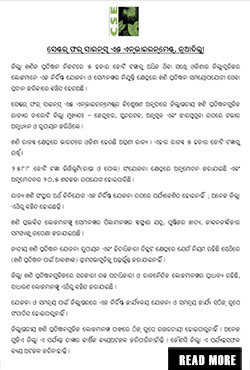 One of the biggest issues emerging in all districts of Odisha is child nutrition. However, it is a pity that practically no district has made the required sanctionto improve child nutrition and health. Classic examples arethe state’s two biggest mining district Keonjhar and Sundargarh. “It is a pity that Keonjhar with Rs 1,524 crore in DMF has sanctioned less than Rs 2 crore for child nutrition and development. The district’s under-5 mortality rate (U5MR) in rural mining areas is as high as 70, and nearly 45 per cent children below 5 years are stunted or underweight,” said Srestha. Similarly, in Sundargarhwhere about 50 per cent rural children are stunted and the U5MR is as high as 67, only Rs 3 crore has been sanctioned for this. Equally neglected is healthcare. Most districts not only face a shortage of health infrastructure but also healthcare staff, particularly doctors, as compared to prescribed Indian Public Health Standards (IPHS). Angul, where primary health centres (PHCs) and community health centres (CHCs) both have a 50 per cent deficit of doctors, has invested only 5.6 per cent of its Rs 242 croreallocation in healthcare. In Sundargarh, healthcare investment is a mere Rs 33 crore, which is one-tenth of the moneythat the district is spending to build roads through DMF funds,” points out the CSE report. DK Jena, additional secretary, Odisha Planning and Convergence Department, said that DMFs are relooking into many of the critical issues. These include getting healthcare staff in health centres which is a key problem in mining areas. districts do not have dedicated DMF offices for planning and monitoring. “PMUs are no substitute for a full-time DMF office comprising planning experts who can do a gap-analysis, conduct consultations with the Gram Sabha and plan DMF investments based on the district’s resources. Therefore, the state needs to give appropriate directions on this,”said Srestha. Regarding information on DMF among the people, many civil society members and people from mining-affected areas said there was none. DK Jena promised that the districts will be directed to improve knowledge dissemination on DMF and share information in simple ways with the people. Odisha districts are among the few in the country that have made progress on DMF audits. Odisha is one of the states which has developed a DMF website with district-specific information. The website contains details of the DMF trustees and members, fund allocation and expenditure, and minutes of meetingsof the DMF body. However, as far audit mechanisms goes, the DMFs need to do much more. While some districts have done financial audit, no performance or social audit is being done. All districts must identify DMF beneficiaries; there cannot be a Trust without beneficiaries.This will also help in targeted investments, such as for addressing women and child development issues. Gram Sabhas (and ward members where applicable) should have a representation in the DMF body. Not following this is in contravention to the spirit of the DMF law. For efficiency of operation, all DMFs must have an office comprising of officials and experts. Independent organizations/planning experts can be roped in from time to time for effective planning. PMUs cannot be substitute for a full-time DMF office. The intended autonomy of the DMF Trusts should be maintained to ensure local need-based panning; state governments shallprovide necessary guidance to ensure proper planning, investments and functioning of the trust. A systematic and bottom-up approach must be adopted to make investments effective. DMFs must not only focus on high priority issues, but also prioritize investments in directly affected areas. Bottom-up planning can also help to maximize the potential of the convergence approach the state is considering. Public disclosure of information is key to DMFs’ transparency of operations. District-specific DMF-related information must be made available through a website. To ensure people’saccess, information should be shared by using panchayat-level platforms. “As we enter the fourth year of DMF implementation, it is time we sorted out the planning and implementation issues. Without bottom-up planning and proper institutional structure, DMF will not be able to deliver. We need the involvement of the beneficiaries in planning and monitoring, to make DMF transparent and accountable. Let this be the agenda for the coming year,”summarizedChandra Bhushan. Please visit cseindia.org for all our reports, press releases etc on DMF.